The Amish Fiddle Windsor Chair is a popular Amish country-style dining chair featuring a fiddle back and turned leg styling. It's a perfect showcase of the dedication Amish craftsmen are known for. The fiddleback is from the Windsor family, featuring a fiddle shaped central splat among spindles. Windsor furniture like the Amish Fiddle Chair are favorites for country style kitchens. 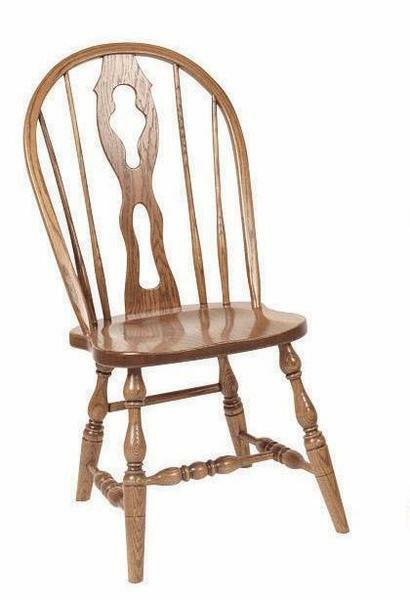 Complete the look of your new Amish Fiddle Chairs by clicking on your custom options. If you'd like some help, Amish Furniture Specialists can be reached by email or telephone. Thanks for taking time to shop with DutchCrafters, home to the largest collection of Amish furniture available online. Height from Floor to Top of Back: 39"